Image: Target, Old Navy. Design: Ashley Britton/SheKnows. Halloween means costumes, right? But costumes are usually only worn on the 31st (unless your kid is the one who sleeps in her Darth Vader costume until Christmas, in which case more power to her) — and then packed away and forgotten. Only one day to show off all your Halloween spirit? Fuggedaboutit. 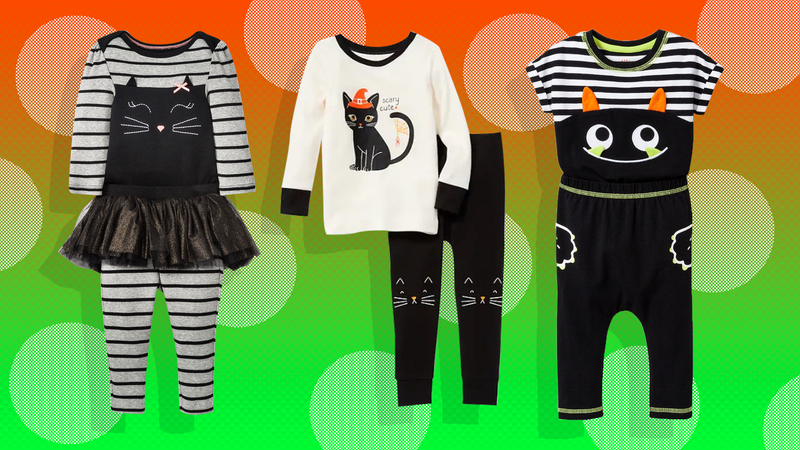 Luckily for you (er, for your kids, rather — yeah, this is totally about your kids), there are plenty fashionable Halloween-themed threads emblazoned with black cats, ghosts, monsters and pumpkins that let you celebrate Halloween in style, no actual costume necessary. So, how to avoid searching every store for some cool and spooky kids clothes that aren't covered in glitter and googly eyes? Read on. The outfits ahead are plenty festive but still low-key, so kids can strut their Halloween stuff all October long — and hey, a lot of these are great for other months too. Halloween. Doughnut. Pajamas. Doughnut. Pajamas. I… I don't think I need to expand on that. Run, don't walk, to your nearest Gap to purchase these or buy them online. These Swedish slipper moccasins are durable, soft, easy to get on and stay on tiny feet and come in a rainbow of colors. 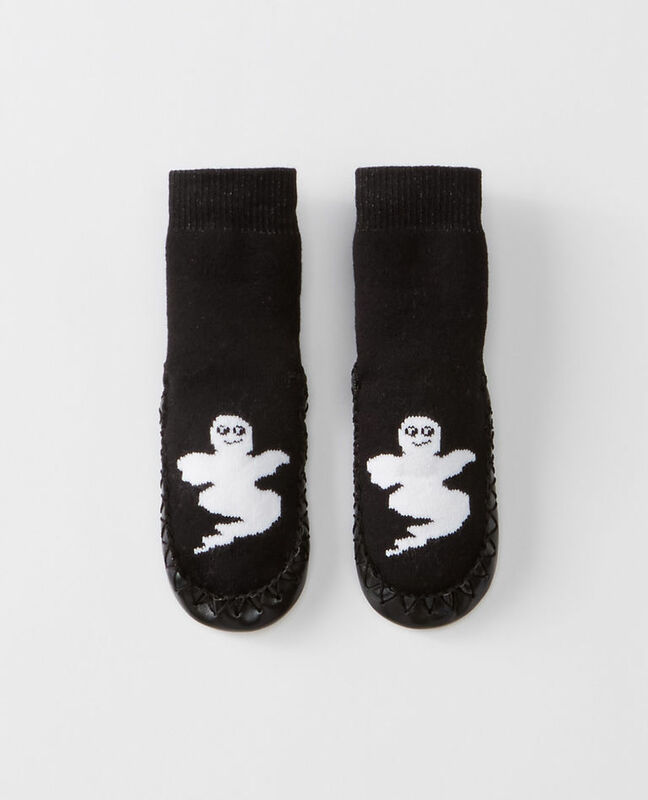 For Halloween, a ghost and a black cat are two options for your small one's footwear. They're equally darling, so you might have to get both. This amazing knit striped sweater looks inconspicuous enough, but flop up the hood and voilà! Your child is transformed into a horned, fanged monster. The buttons and stripes make it a closet staple all October long for sure. I'm sorry; a cat onesie with a tutu?! Why don't they make this in adult sizes? 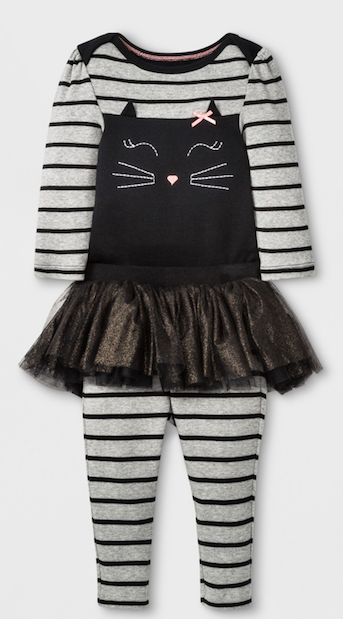 This ultra-comfortable striped cat onesie with matching skeggings (that's a skirt/leggings combo, for those of you who were unaware) is not only stinking adorable but made from 100 percent cotton so your tiny terror will be comfy day and night. The tiniest among us might be too young for trick-or-treating, but that doesn't mean they can be excluded from the festivities. This adorable footed onesie has a delightful print of a trick-or-treating bear wearing rabbit ears. Because if a bear were going to dress up to go trick-or-treating, it would be as a rabbit. Obviously. 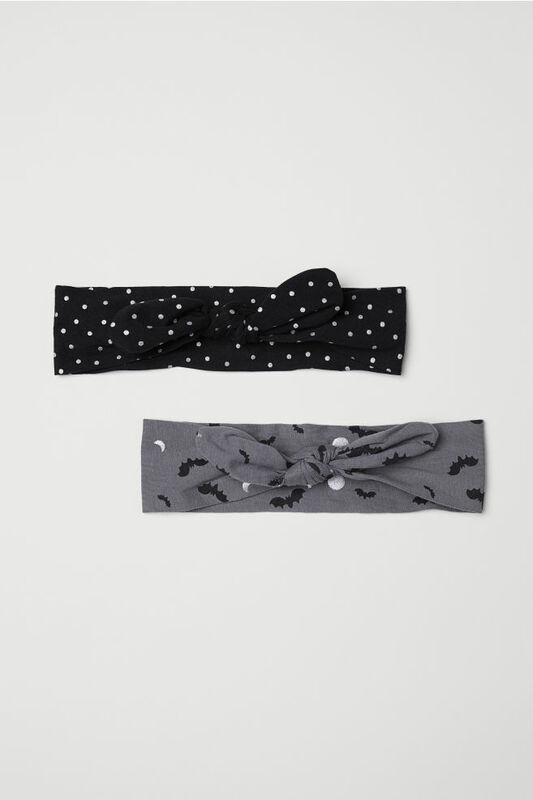 Bring your entire Halloween outfit ensemble together with these soft headbands from H&M. The devil is in the details, and in this case, the details are black with white polka dots and bats and moons on a gray background. Is there anything cuter than a big monster smile on a baby's Buddha belly? No. That was a rhetorical question. But a close second might be the matching pants, which have monster paws for pockets. 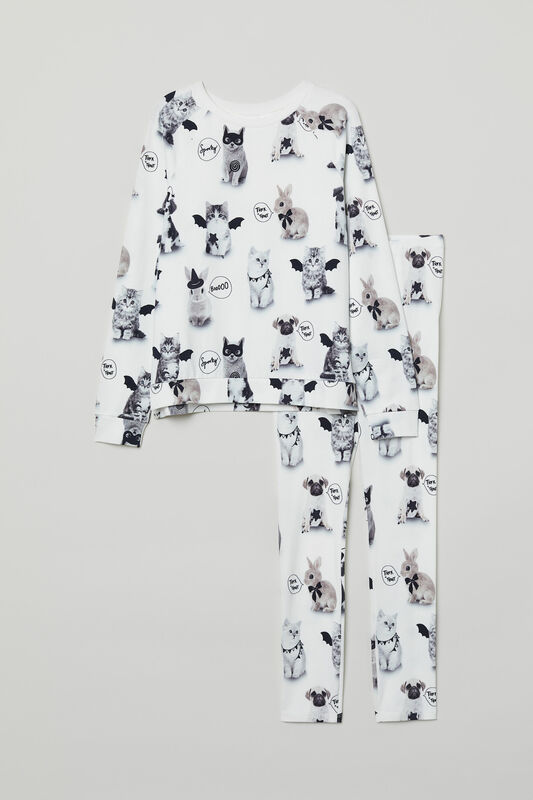 These soft pajamas are plastered with kittens and bunnies wearing masks, witches hats and bats wings. Kittens and bunnies. Need I say more? This tulle skirt from H&M is a subtle nod to things that go bump in the night with its flock of bats flying up from the pointed hem. You probably wouldn't even notice they were bats unless you looked closely, which means this skirt is something you can wear year-round whenever you're feeling particularly dark and twisty. All parents think their kids are scary-cute (sometimes, more one than the other), and this outfit will make that factual. With cat faces on the knees and a cat in a witches hat, this pajama set is going to become their new favorite daytime and nighttime outfit. This shirt-and-leggings combo is spook-tacular! (Face-palm. I know. I had to.) Bones and pumpkins spell out "Boo!" on the shirt, and the joggers are covered in beautiful bats. 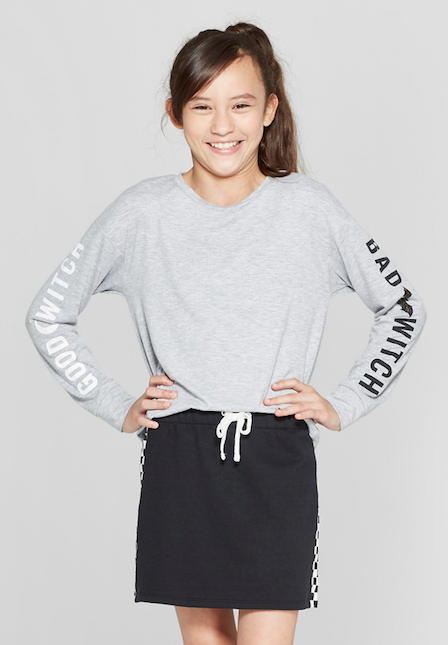 Everybody has a good side and a bad side, but now you can show off both sides simultaneously with this long-sleeve "Good Witch, Bad Witch" shirt from Target. The black monster design on this already incredibly soft and cozy onesie is furry, and with its zipper mouth and five eyes, this will be worn again and again. 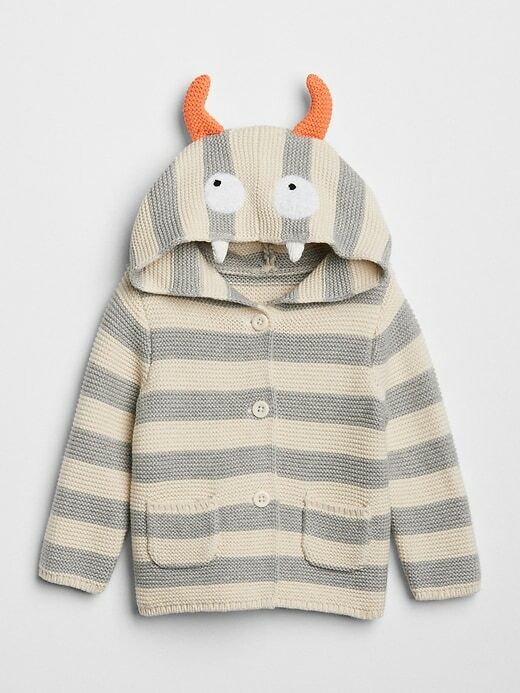 As if you need another reason to cuddle your tot. Don't forget about your littles tootsies when planning Halloween outfits. 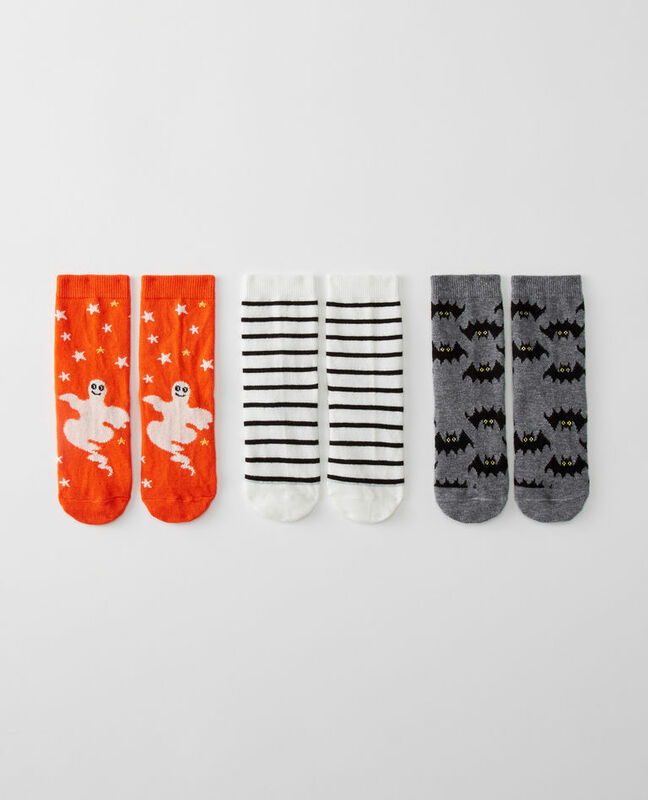 This three-pack of perfect Halloween socks will keep toes warm and are low key enough to be worn for October, and beyond. 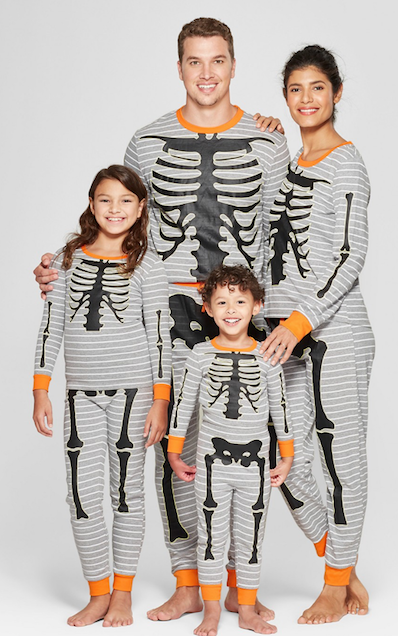 If you're going to wear Halloween pajamas, you might as well match with your entire family, amiright? 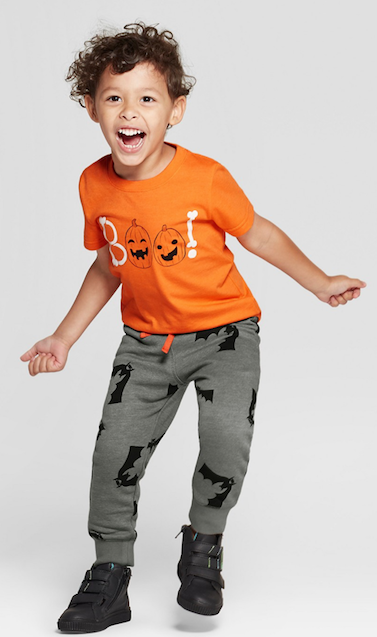 These pj's are perfect for watching It's the Great Pumpkin, Charlie Brown! or another Halloween favorite curled up on the couch with some munchies. 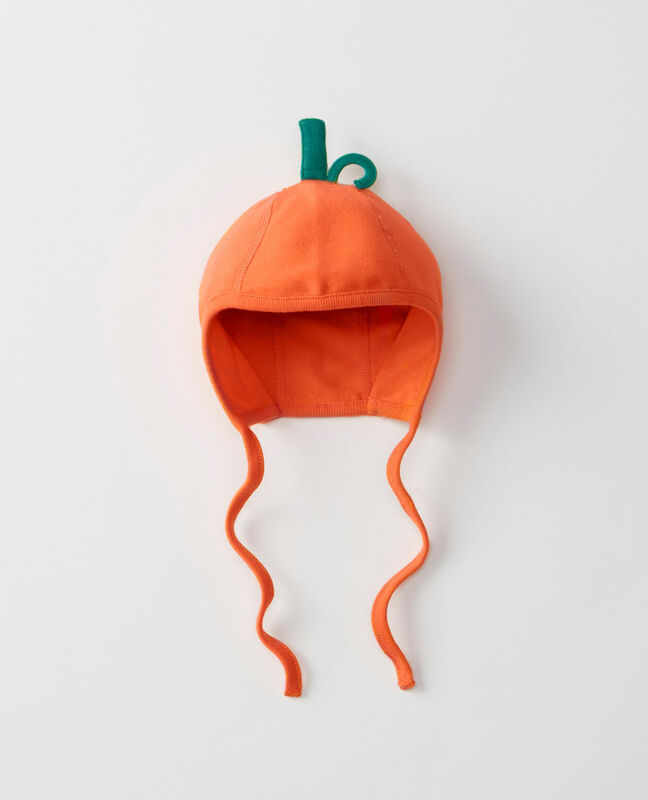 Babies should keep their little bald heads protected from the encroaching autumnal chill, and what better to cover their heads than with a knit pumpkin? This veritably guarantees your pumpkin will be the cutest in the patch. 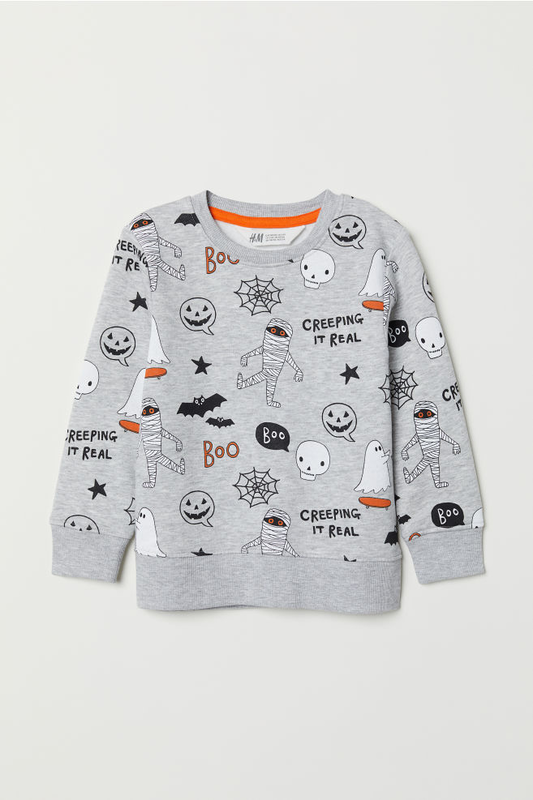 Covered in mummies, skulls, bats, ghosts and cobwebs, this sweatshirt declares the wearer to be "Creeping it real." Made from 100 percent cotton, this long-sleeve ribbed sweatshirt is both stylish and oh-so comfortable.